Banjo Liquid Handling Valves are designed to be used in various Agriculture and Industrial liquid applications, providing high quality liquid handling solutions. All Banjo Liquid Handling Valves are manufactured and/or assembled locally in the U.S. Banjo Liquid Handling Valves are available in glass injected polypropylene and stainless steel materials, with operating pressure ranging from 100 – 1,000 P.S.I. depending on type and material. Liquid Handling Bolted Valves are used in the transfer of liquids in Agricultural and Industrial applications. 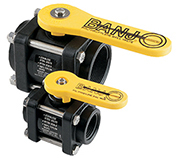 Banjo Liquid Handling Bolted Valves are available in various threaded configurations, glass injected polypropylene and/or stainless steel materials, and range from 1/2” to 4” in size. 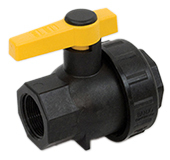 Click here for Bolted Valves with Universal Manifold Connections. Liquid Handling 3-Way Valves are used in various Agriculture and Industrial liquid flow applications. Liquid Handling 3-Way Valves are available in various threaded configurations, glass injected polypropylene and/or stainless steel materials, and range from 3/4” to 3” in size. Stubby Liquid Handling Valves are great when working in tight spaces. Nozzle Liquid Handling Valves are used in various Agriculture and Industrial liquid flow applications. Nozzle Liquid Handling Valves are available in various threaded configurations, glass injected polypropylene materials, and range from 1” to 2” in size. Single Union Liquid Handling Valves are used in various Agriculture and Industrial liquid flow applications. Single Union Liquid Handling Valves are available in glass injected polypropylene materials, and range from 1/2” to 2” in size. Spin Weld Liquid Handling Valves are used in various Agriculture and Industrial liquid flow applications. Spin Weld Liquid Handling Valves are available in glass injected polypropylene materials, and range from 1/2” to 2” in size. Liquid Handling Check Valves are used in various Agriculture and Industrial liquid flow applications. 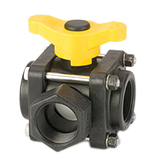 Liquid Handling Check Valves are available in glass injected polypropylene materials, and range from 1” to 3” in size. Stainless Steel Liquid Handling Valves are used in various Agriculture and Industrial liquid flow applications. Stainless Steel Liquid Handling Valves are available in Stainless Steel materials, and range from 1/4” to 3” in size. 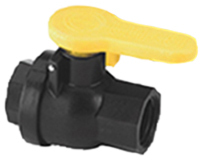 Polypropylene Air Actuated Shutoff Valves are normally open valve, and has a maximum liquid pressure of 70 P.S.I.